A Permanent State of Re-invention – CONNECT! I turn around and look at the teacher I was in August and my perspectives have changed so dramatically that I have some difficulty remembering exactly what it felt like ‘before’. I remember sitting down to plan with Amy Park in August and being confused about how to allow for openness in learning while restricting inquiry to the curriculum topics. I remember answering a question about ‘inquiry’ in our first staff PD and feeling uncomfortable with the answer. I remember driving to the Shuswap reading Fosnot and having the feeling that we were on to something big by introducing conversation and conjectures in mathematics but being terribly unsure of how to properly explain the necessity of cultivating understanding vs. memorization. On my own journey of inquiry into how best to construct a classroom of passionate exploration and powerful educational experiences, I have had three important conversations that stand out. The first was two days before the school year began as I sat down to plan a year of learning with my new teaching partner. I had not yet given lesson design any thought, I knew Amy knew inquiry and expected the direction to come from her. We began with a look at the curriculum and I was instantly lost between a desire to open the topics completely and the feeling that we would be better to address each area of study bullet point by bullet point. Unsure of how to connect these, I asked Amy if, in an inquiry classroom, the teacher knew where they were heading. ‘Absolutely,’ was the response. ‘If you don’t know where you’re going, how do you know when you get there?’ First lightbulb! Start with ‘what do I want them to ‘get’, see, appreciate or understand.’ Ask questions but understand that directionless questioning will result in directionless exploration and people disengage without a destination. I love analogies, so here’s an analogy of how I was suddenly able to appreciate an inquiry-based lesson design. My second ‘A-ha!’ was during our first PD of the school year as I returned my ‘what is inquiry’ sheet to our PD and Outreach Coordinator Neil Stephenson. We had been asked to identify examples of inquiry in the work we had undertaken in our classrooms. I struggled to find examples. I wasn’t sure they were good ones. I wasn’t sure I had hit the nail on the head in my explanation of what inquiry was. I was uncomfortable with the fact that I was partly wrong. ‘I’m not happy with my answers’ was my comment to Neil as I returned my sheet. ‘That’s fine, you don’t need to be’ was the response. It was the first time that I considered there to be value in acknowledging an unknown. By identifying the fact that I was unsure about the answers I allowed for possibilities. Neil’s response provided a challenge and opened a space in which to inquire. The topic of inquiry, what and how, became exciting because it was presented as uncharted territory. No one had given me an absolute answer and I was lead to believe that a permanent definition might not even yet exist. The third lightbulb came over a weekend away at the Shuswap in which I took Fosnot’s Young Mathematicians at Work – Multiplication and Division and David Perkins’ Making Learning Whole and then tried to explain to my husband the irrelevance of ‘training’ children to memorize mathematical equations and concepts. I remember being most frustrated by my inability to answer his question with authority. ‘I just don’t exactly know yet’ was my mostly huffy response as I rushed back to the books I’d brought with me to blend a Fosnot/Perkins perspective into an answer. I didn’t get an absolute answer for Scott from my reading. But I did get an appreciation for the things you learn on the path of discovery. And two weeks later, as Amy and I tossed around some questions for Math over the phone, I finally had that next ‘A-ha!’ as we reflected on the difference between teaching them answers and asking them questions… ‘Are we getting kids to think, or are we telling them what to think?” was her question as I elaborated on how I had arrived at the idea that rather than give them strategies for each multiple, we ask them which to discover their own. I finally had an answer for Scott and was one step deeper into understanding the process. Through connecting with other brilliant educators on twitter, by reading an insane amount of blogposts, and trying to justify my new understandings to everyone I meet, I have had hundreds other lightbulb moments, but these three still stand out as transformative. For other teachers on the trip up the mountain, though I am still nowhere near the top (and am starting to think that getting there might not even be the point) I’m high enough that I’ve had glimpses of the view and man is it powerful. 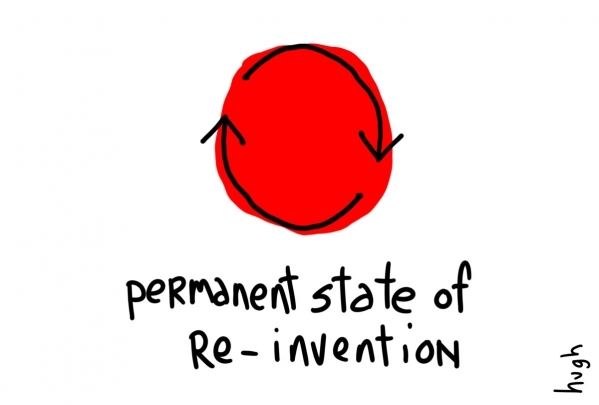 I love the idea of being in permanent state of re-invention. I think that in my practice I have changed my units and projects every year, sometimes mid year. All to often educators create project and assignments that become their canned resources that don't change at all. Another thing that I agree with is the idea of the path that students take to reach a deeper understanding of an issue or topic. That Neil Stephenson guy always encourages my to think in terms of BIG IDEAS. I found this helpful to guide my communication of expectations and final products to my students. In some respects though, the final product isn't always what's most important, its just like your quote about the mountain: it's often the stops along the way that are more important to learning than the finish line. Here's something to think about. Are you comfortable with the big idea guiding you and NOT knowing exactly where the students will end up? Guiding students along a path of inquiry often requires that we as teachers give up the control that we are programmed to require. It's actually more difficult to facilitate, and takes more skill as a teacher to know when to support and guide students. This is something I'm still working on even after 11 years of teaching. Thanks for the post. You are very lucky to be in such a collaborative school! Thank you for such an inspirational post! I think you've hit the nail on the head in terms of what it means to be a life-long learner and engage in transformative inquiry. I'm taking part in a professional inquiry class in teacher education and I'd love to share your analogy of the mountaintop with my peers. @Jared Thank you so much for the feedback! I definitely agree that the big idea (mountain top) has been so helpful. I think what I am coming to realize too, is that the idea of having a finite goal can also be limiting to student engagement and thinking. I have started considering big ideas in terms of 'questions' which provide infinite possibilities, instead of 'objectives', which can be limiting. Maybe the peak of the mountain should be obscured by clouds and grow as you climb?? 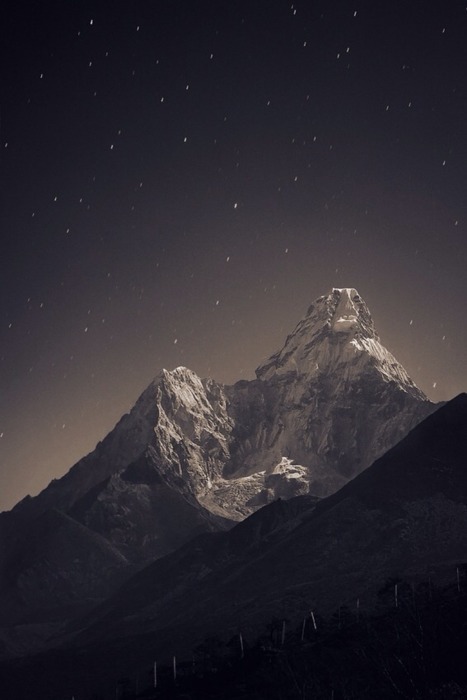 I agree that big ideas are more challenging because we’re not ‘in charge’ the whole way and because we also need to know ‘the mountain’ more intricately so that we are aware of what questions to ask in order to guide our students ‘upwards’. Ultimately though, once students ‘find their own legs’, we seem to get higher much faster than we might otherwise because students learn to trust their own thinking, form their own conjectures and solve their own problems and we become, in a sense, less necessary…? @Meghan I’m stoked that the analogy made sense to you! It has also really helped me make sense of a process that I have struggled to understand in the past. Let me know if there’s any further feedback? If I have learned anything from the process it’s that there’s so much more to learn. @Ivy Muchas gracias Mrs. Waite!